Access the benefits of visible OCT with our newest line of Cobra spectrometers. The Cobra VIS has been designed with all the benefits of our flagship Cobra-S spectrometer for high resolution, high speed imaging at visible wavelengths spanning 400-700 nm. 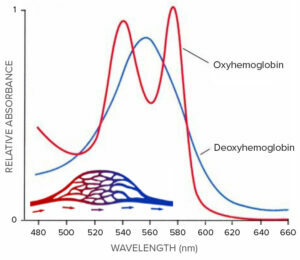 Use of visible wavelengths allows spectroscopic information about blood oxygenation to be collected simultaneously with OCT images, adding another dimension to structural and functional imaging of tissues. This facilitates live 3D mapping of perfusion in tissues, with tremendous potential benefits in fundamental research, diagnostics, and clinical care. Resolution improves as the square of the center wavelength, which gives vis-OCT a tremendous advantage. With up to 2x better resolution than 800 nm OCT, vis-OCT allows improved discrimination and measurement of structures. As experts in spectrometer design, we have developed diffraction-limited optics for use in the Cobra VIS, compensating also for chromatic aberration across the full visible band to ensure maximum sensitivity and minimum roll-off for superior images. Our industry-proven high throughput spectrometer design is paired with robust, athermal optomechanics and the fastest camera on the market for extremely high resolution imaging at up to 250 kHz. High speed is particularly important in vis-OCT, which can suffer from motion artifacts when performance at low line rates. 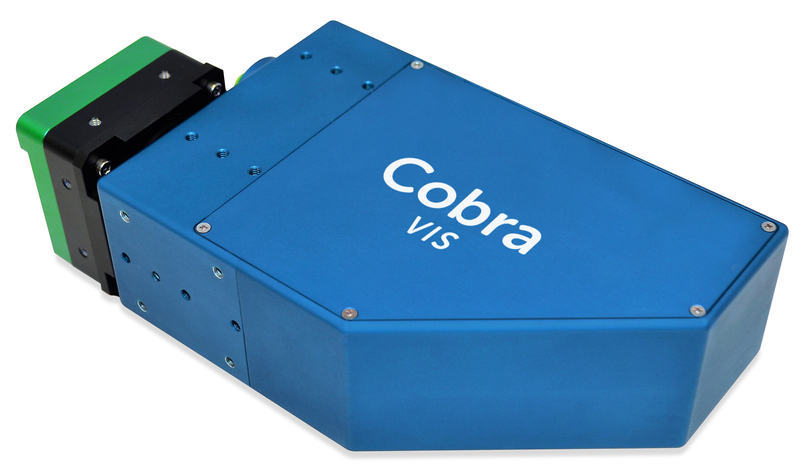 Cobra VIS visible range spectrometers can be used for ultra high speed OCT imaging in the 400-700 nm range in research, industrial and OEM solutions. Let our expert team put together a configuration that is right for your application – contact us at info@wasatchphotonics.com. Reap the benefits of speed and flexibility at reduced cost with USB 3.0 connectivity. USB 3.0 eliminates the need for an expensive camera link card and allows compact computers like personal laptops to be used for OCT imaging. The power of USB 3.0 combined with our dedicated software libraries facilitates easy integration of high-speed OCT into your imaging platform. Cobra VIS part numbers are of the format CS550-[CWL]/[BW]-[kHz]-[camera][pixels]-[interface], where the e2v OctoPlus camera is represented by “OC”, 2K denotes 2048 pixels, and the interface is either camera link (up to 250 kHz, denoted by “-CL”) or USB 3.0 (up to 130 kHz, , denoted by “-U3”). Contact us at +1 919-544-7785 or info@wasatchphotonics.com to discuss your specific application or other wavelength & camera options.